MONTGOMERY, Alabama — Governor Robert Bentley announced today that Two Rivers Lumber Co. plans to invest $65 million to build a state-of-the-art sawmill in Demopolis that will create 55 jobs initially and a total of 95 eventually. 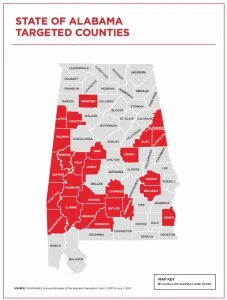 “I am committed to helping the rural areas of the great state of Alabama become more prosperous through business growth and the creation of new jobs,” Governor Bentley said. “This investment from Two Rivers Lumber Co. will provide well-paying jobs to Alabama citizens and drive economic growth in Marengo County. “Our partnership with the company perfectly aligns with the goals we’ve set to help the state’s rural counties,” he added. The company said it expects many indirect jobs in the forest products industry will be created as it expands to support the operation. Two Rivers’ new sawmill will be located in Marengo County, one of Alabama’s so-called “Targeted Counties” under incentives legislation adopted in 2015, meaning the project is eligible for an enhanced benefit for job creation. These counties have fewer than 25,000 residents.